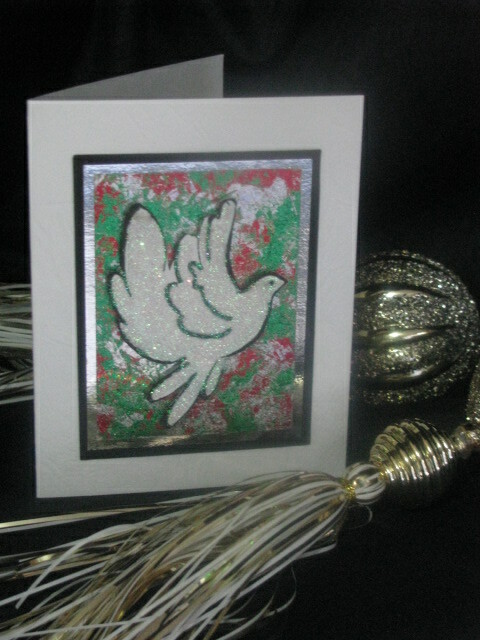 Well as promised I have some more of the wonderful Christmas Cards that I made yesterday. These card fronts were already stamped, coloured, cut or what ever and ready to be used. So making so may was a breeze. No wonder I sailed through my 'stuff'. 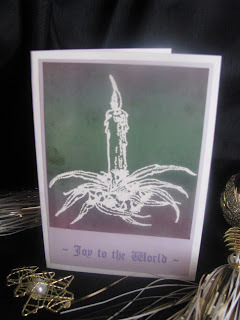 Going by memory, I brayered a glossy card and then stamped this candle and embossed it with White Embossing powder. I am not a fan of embossing esp on glossy card as I find static is a problem even with an anti-static embossing puff bag. Apparently, this one was one of my more successful efforts. I don't have this rainbow pad anymore so I can't tell you the colours used. I layered it onto a shimmery lilac paper from my (huge) pile of scraps. 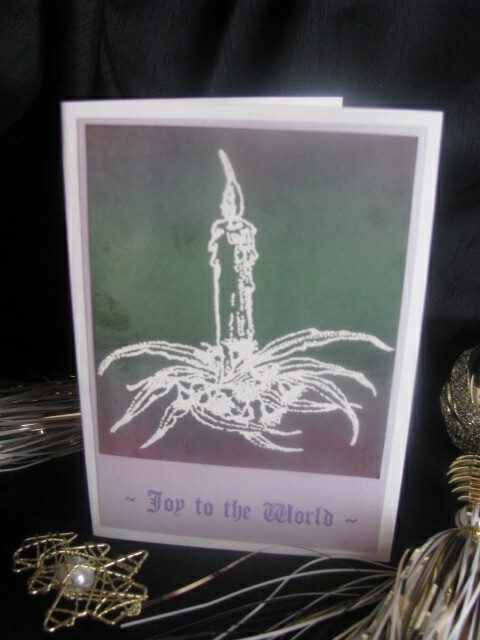 I stamped the Joy to the World greeting in a hybrid purple dye ink. This dove (most likely Stamp-it or Penny Black) was already stamped, glittered (Stamp-it Crystal Ultra Fine) and cut. I paired it with a lovely foiled panel I found in my pile of patterned scraps. If people are interested I could do a tutorial sometime in the future of this quick & easy foiling technique. I have two piles of scrap cards, a huge pile of plain papers, which just last night I had colour sorted into an old expanding file. I have a slightly smaller pile of the patterned card scraps which are just loose in an A4 box, which I have to browse through when I want to use them up. These cards will be available at my zibbet shop, "Inkspirational Designs" soon! Come back tomorrow for Part 3.